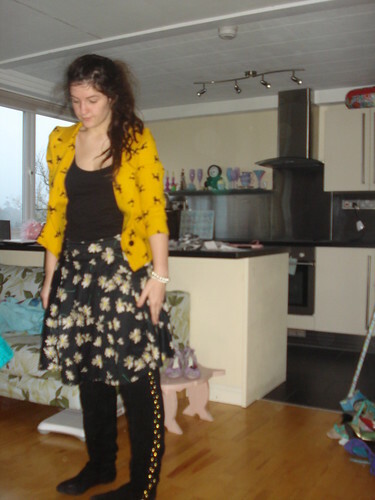 t*rexes and tiaras: and they were all yellow..
i realise that with this post and yesterday's, my recent outfits are looking predominantly yellow..i didn't even repeat any of the items, so i guess i have a lot of similar outfit pieces..
i love this mustard blazer; the colour, the fit, the quirky poodle print (of course)..it was one of the many things which i had to rely on Super-Alex to track down for me on her travels, as i saw it online (as usual) and then couldn't find it in any stores near me (of course)..i remember going to ask in our local H&M and receiving a rather funny look and a comment of "i'm sure i would have remembered something like that! when i tried to describe it"
i also recall the day when i was away at a huge guide camp, for a week and by about halfway through, the stress was getting to me - some of the leaders we went with can be particularly trying - so i had escaped with another, and we were getting more and more stressed trying to locate a supermarket and then get back with what we needed in time to prepare dinner..as we were doing an illegal U-turn in the middle of a road and in front of a bemused police car, i remember the ping of a text from alex to say she'd found me my poodle blazer, and my day's stresses seemed to disappear! so, as after all that fuss, i have only worn it a couple of times, i decided that it had hung around on the rail of my bed for long enough and deserved an outing..this new look skirt was hanging near to it on the rail (i use the rails of my bed for extra hanger storage, as the wardrobes are all full!) so i thought i would put them together..i added these boots because i thought i would have to be walking into town at lunchtime to go and buy our ghost-tour tickets for our rangers trip next week, but i managed to get them paid for over the phone and luckily mum picked them up on her trip into town earlier on ! but it's been a chilly day and i have been glad of them..i'm still feeling rotten with my cold, and my twitchy eye seems to be back as well, so i think i would plump for comfort over stylishly high heels today anyway.. 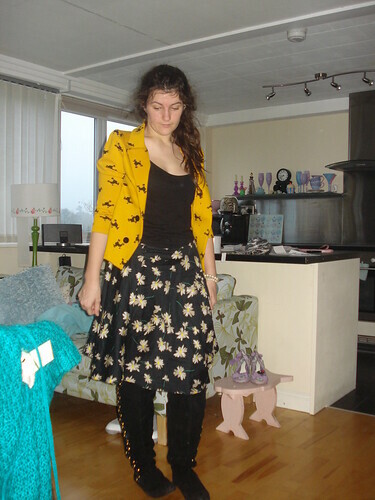 I really kick myself now that I passed up the dress-version of this skirt, the print is so cute with mustard! I may have to Ebay-trawl for it after seeing your post. Charl, your blog is v bad for my £50 monthly clothes budget! You are so good at matching items that are different! Brilliant! I have the dress version of the skirt, I love it.